32: Part Zwei Und Dreizig: Planet-F1 is proud to bring you the exclusive, unedited text from Michael Schumacher's (relatively) secret diary. 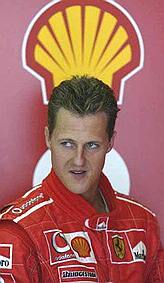 Hello my adoring Schumi-files. Well as you can see there is life in the old doggy yet. Yes a 71st winners trophy from Melbourne for my enlarged and wholly recreated trophy wing at the new house. Doughnut pudgie wudgie face (mit dem grossen lieben handles - woof woof) is already talking about another move for us if I intend to stay in F1 for much longer and surely if the Michelin tyres are as useless as they set out to be in Melbourne then the 100 GP total is a possibility. The other teams are saying that the cold temperatures are catching them out. Yet they have been testing in the same climate all winter. Madness on a bike! Both Rubens and I could not believe how easy it was for us. And in addition the person everyone and his pet monkey is predicting will win the championship, yes, Mr.Raikkonen, is pulling off the road like he was Honda powered. Do I miss competing against my old rival Jacques Villeneuve? No. I haven't competed against Jacques since he moved to BAR. Yes, I have lapped him, but as for fighting in races this has not been done. To a certain position I can understand the people who say that the grid is half formed with people taken off the driver supermarket shelves and it is not the same as the 90's when people like Senna, Prost, Lauda, Mansell and Piquet were around. But is that my fault? How can there be other World Champions when it has been me, me, me for so long? It is good to see my old friend Max Mosley has retired to Monaco. He will find the climate there much better than London. I was told by Ross Brawn that when most English people get old and lose their senses they move to Eastbourne. The sunshine of Monte Carlo will be much better for his health. Ever since Max didn't travel to the Far East for the opening races of last year I have been secretly thinking he is worried about health issues and losing all his marbles out of the bag. And talking on this subject, the people who criticise the new qualifying format for races as boring before they give it a chance are making me mad. What is boring about seeing one single car lap a circuit on its own for two hours. This is what I do in testing and it is very stimulating. Back home at Chateau Schumi, or Schateau Schumi as we humorously like to call it, I have Frau Blucher tape recording all the sessions for 2004. Then, if I find myself with a bored moment at home I can play back the tapes. So, we will find out more the shape of the season after the Malaysia Grand Prix. It will be hot but I am ready for that having completed three race distances in our home sauna wearing my full overalls and helmet. Ferrari said they had a spare F 2003 chassis and so I installed it in between the knotty pine benches and the heated granite rocks. It was totally realistic - every half an hour I got Lieblings Donought to come in and simulate a pitstop. Though I did not get her to change all four tyres. One point I am not so happy about is that Willi (Weber) is making himself look stupid over Ralf. This whole idea that Renault have secretly made a deal to sign Junior for 2005 is so obviously not true that I would have laughed if my children had thought it up. Ralf wants to get my kind of salary for doing much less which was always his way at home. It was me who had to wash up the dishes while he played with his Kinder Surprise. It makes me secretly think that I could have got a lot more money from Ferrari if Willi had played the right strategy game with them (and let us not get onto the Schumi toilet seats right now). Perhaps that is something to bear in mind for my 2007 and 2008 negotiations.